If you imagine what an authentic Italian hotel might be: tons of drama, grand, historic, and bubbling with peculiar guests who never seem to take off their sunglasses–you’ll find it at Locarno. From its birdcage elevator to hand-printed wallpaper, this charming hotel is a monument to art deco, and I’m sure you’ll find yourself waking up each day feeling more and more Italian. 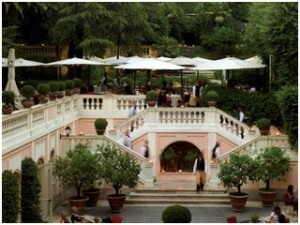 Teeming with elegance, the Hotel de Russie offers guests beautiful gardens, Roman ruins, and views of Villa Borghese. Enjoy the butterflies in the secret garden, dine alfresco, or relax in the Turkish steam bath after some beauty treatments. 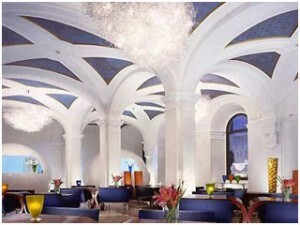 If you want luxury, you’ve found it here in this beautiful hotel. This Art Noveau estate on the Tiber River bought by Anna Fendi has a guest villa, which has been transformed into a 15-room hotel for lucky guests. Most of the rooms have access to the meandering gardens, and the decor of the rooms are quite eclectic, mixing early 20th Century Furniture with modern designs. 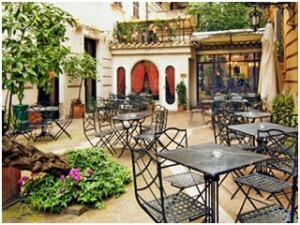 This hotel is quite tranquil and astonishingly different from anything else in Rome. 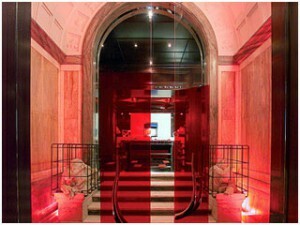 If you love shoes, check out this elegant extension of the Ferragamo empire. 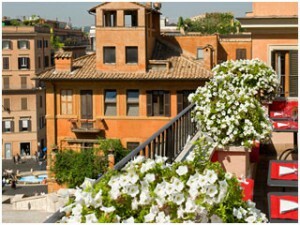 Convenient to the heart of Rome, this intimate residence spreads out over six floors of a lovely townhouse with views of the via Condotti, where one can find the best luxury fashions. Aside from shopping, you’ll find a rooftop terrace complete with a fireplace, and a mini-gallery of Ferragamo sketches, photographs, and memorabilia. 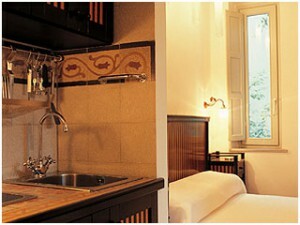 With only four rooms, which look out onto the Spanish Steps, Il Palazzetto offers a romantic hideaway for its guests. You can even take some wine courses that are provided throughout the day, as well as call up the in-house sommelier to offer selections of reds and white for you to try. 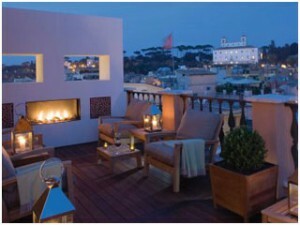 So close to the Spanish Steps and the best designer shopping in Rome at the Piazza Spagna, Hotel Art not only provides a favorable location but also offers guests sleek style and clever design. Devilishly stylish, the Aleph is a popular destination for the fashion set. The hotel’s design relies on the contrasting features of heaven and hell, and while it might be difficult for guests to choose just one, you will be amazed by some of the details, including hologrammed bookcases.